Tony Hayward, Chief Executive Officer of BP is to be replaced by Bob Dudley, the U.S. executive managing the company’s response to the spill in the Gulf of Mexico. In a move aimed at softening U.S. criticism towards the British company, Mr Hayward, 52, is expected to negotiate a leaving package under basic contractual terms. That means one-year’s pay of £1m and a pension pot of more than £10m, capable of paying out more than £500,000 a year when Hayward reaches 60. The change of face was confirmed upon announcement by BP of one of the largest losses in British corporate history because of the cost of the catastrophic oil spill in the Gulf of Mexico. In its second-quarter results the company has set aside $32.2bn (£20.7bn) to meet the cost of the clean-up, far higher than the City had expected and plunging the company into a $17bn loss, compared with a profit last year of $3.1bn. To pay for the mounting costs of the spill created by the explosion on the Deepwater Horizon rig on 20 April, BP plans to sell $30bn worth of assets – predominantly oil and gas fields – over the next 18 months. BP has seen its reputation shattered by the spill in the Gulg of Mexico, the worst ever U.S. environmental disaster. According to government estimates, over 5 million barrels of oil have spilled into the Gulf since 20 April, when a huge blast killed 11 rig workers and started a spill that has devastated fragile ecosystems and communities along the U.S. Gulf Coast. The BP spill has affected about 637 miles of the Gulf shoreline, about 39 percent of the coast that stretches from Brownsville, Texas, to the Florida Keys, hitting the coastlines of all Gulf states and killing or injuring countless sea creatures and coastal birds. But BP’s reputation was not weakened just by the unprecedented proportion of the oil accident, it was rather Tony Hayward himself who helped a great deal. In the last few months he got famous for a variety of gaffes, that have triggered deep resentment worldwide and particularly within the American population. Members of the American Senate have since widely criticized him for his reactions to the spill. Here are some of his most notable quotes. I think the environmental impact of this disaster is likely to be very, very modest. There’s no one who wants this over more than I do. I would like my life back. 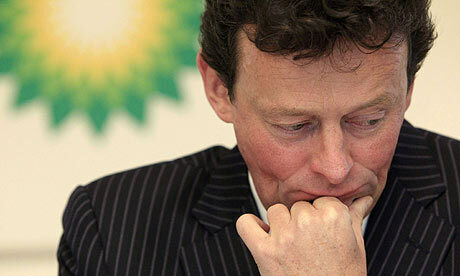 Will the demise of Tony Hayward be good for BP? it sure will, true as it is that the company’s shares rose almost £2bn upon first rumors of his departure. But will it change things for real? it’s hard to say. BP has been forced by Washington to set aside $20bn into an “escrow account” that can be used to pay out the billions of dollars worth of claims expected from those who have suffered financial hardship as a result of the spill. US Congressman Ed Markey – chairing a committee covering the oil spill issue – said: “While it’s now happy sailing for Tony Hayward, rough conditions will persist in the Gulf of Mexico for years to come because of his failed leadership. The new leaders of BP will have an uphill climb to correct the legacy left”. This entry was posted in Environment, Fossil Energy, Gotta Be Kidding, Water. Bookmark the permalink. Thanks “therapist”, stay tuned there’s a lot more to come. I’ve just started!